Hospice care is somewhat of a step away from the traditional approach to medicine, yet at the same time, it involves medical oversight and standard therapies to maintain comfort at the end of life. Hospice care is then both a philosophy and a type of care that a person near the end of life can receive. The hospice philosophy “neither hastens nor postpones death,” according to the American Cancer Society. Hospice care is said to treat the person rather than the disease, working to manage symptoms so that a person’s last days may be spent with dignity and quality, surrounded by loved ones. Hospice care is also family-centered in that it includes the patient and the family in making decisions. For instance, sometimes a hospital bed will be provided and placed in the family home, so all parties need to be on board with where that bed will be delivered. By definition, hospice care is not for someone who may have many years of life ahead of them. Instead, hospice provides "compassionate care for people in the last phases of an incurable disease so that they may live as fully and comfortably as possible." Hospice focuses on relieving suffering and improving symptoms rather than curing the disease itself. Hospice is focused on the patient's comfort and quality of life during the last stages of advanced illness, which means that some medications may be dropped and others added. A person receiving hospice care can choose to leave hospice and go into active cancer treatment at any point. What Are the Logistics of Hospice Care? The two common forms of hospice care are home hospice care, where nursing staff and hospice team members regularly visit the patient’s home; and inpatient hospice care, where the individual might come from a hospital or their home to reside in a facility that offers round the clock care by a team of healthcare providers. Depending on where you live, and the practices of hospice providers in your area, it may be the case that one of these forms of hospice is available while the other is not. Most people get hospice care at home. People who live in residential facilities, assisted living facilities, or nursing homes can get hospice care at these locations as well. There are criteria to be met before a person qualifies for hospice. A person can’t just decide to use hospice care because a disease is too burdensome, for instance—hospice is specifically for people who are expected to live about 6 months or less if the illness runs its usual course. Medicare, Medicaid in most states, the Department of Veterans Affairs, most private insurance plans, HMOs, and other managed care organizations pay for hospice care. Some programs charge patients according to their ability to pay. Patients who have blood cancer have been noted to use hospice care at much lower rates than patients with the so-called solid malignancies, such as colon cancer or breast cancer, for instance. A group of researchers recently set out to learn why this might be the case. Plenty of cases of blood cancer have no cure, and every year, there are plenty of people with leukemia, lymphoma and myeloma who might qualify for hospice based on the definition of the expectation of 6-months of life or less. So, why would patients with blood cancer and their doctors not avail themselves of hospice at the same rates as people with other cancers? In 2015, this group of researchers mailed a survey to randomly selected hematologic oncologists in the United States to characterize their perspectives on the usefulness and adequacy of hospice for blood cancer patients. They also asked questions intended to tease out some factors that might impact their referrals of patients to hospice. Doctors who cared for both patients with solid malignancies and patients with blood cancer were included among the physicians sampled. 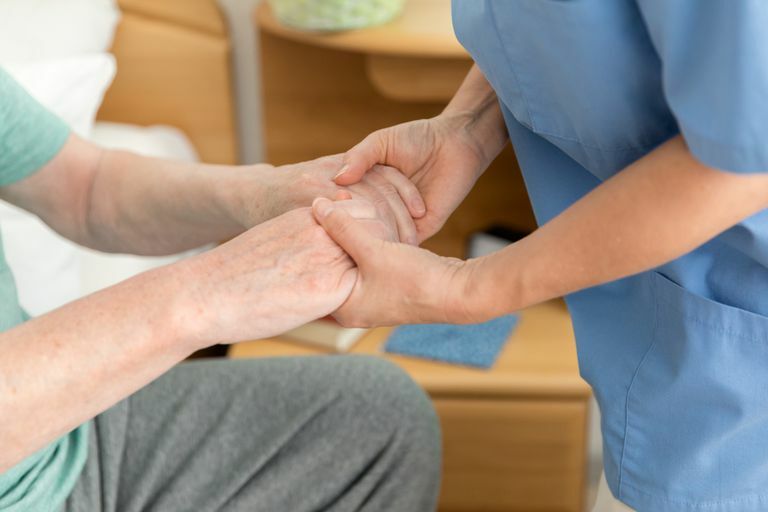 Despite high levels of support for hospice in general, some 46 percent of the doctors who responded felt that home hospice is inadequate for their patients' needs. More than half of the respondents reported that they would be more likely to refer patients to hospice if red cell and/or platelet transfusions were available, and those who considered home hospice inadequate were even more likely to report that they would reconsider if transfusions were part of the hospice package. The therapies that hospice provides typically make the patient's life better but do not prolong life or treat the malignancy, in the case of cancer. These therapies might include medications to help patients control painful symptoms, or to alleviate anxiety, or to assist with sleeping, for instance. As a person nears the end of his or her life, he or she may become less mobile, and therapies to avoid constipation and injury to the skin from all the contact with bed sheets might be used. Medicine might be used to address problems with breathing toward the end of life as well. The question of blood transfusions is a bit more complex. On the one hand, the treatment of a patient's anemia can certainly make a person feel better. However, it is a more invasive treatment than some hospice providers are comfortable with. Some hospice providers explain that transfusions are more of a “Band-Aid” for people at the end of life and are, as such, inconsistent with the hospice philosophy. Not all hospice programs operate in this way, however, and some are equipped to provide transfusions regularly. For patients with blood cancers, transfusions are often a way of life. In fact, many of the less aggressive more chronic hematologic malignancies can be managed effectively for years, and transfusions are often a part of the strategy to shift the malignancy from a death sentence to one that can be chronically managed. "These data suggest that although hematologic oncologists value hospice, concerns about the adequacy of services for blood cancer patients limit hospice referrals. To increase hospice enrollment for blood cancer patients, interventions tailoring hospice services to their specific needs are warranted." One thing that is consistent across different hospice settings is a good measure of inconsistency. Some hospice care settings will definitely allow for blood transfusions. Others, it seems, based on the results of this physician survey, will just as definitely not provide blood transfusions—you or your loved one would have to go off of hospice to get the transfusion in those cases. As the authors of the present study suggest, this might be an area that could experience some change in the coming years, to tailor the hospice practices to individuals with blood cancer. Until then, and in any case, it is highly advisable to learn from your hospice provider what is considered supportive and what is excluded from standard supportive care in the hospice setting. American Cancer Society. Who provides and pays for hospice care? 2017.